John Carpenter seemed to have always been present in some corner of my movie fan life. Perhaps earliest, I can remember as a kid seeing the theatrical poster for “Big Trouble in Little China” in the lobby of the small-town movie palace that was where I had my first theatrical experiences. I immediately thought that it looked like my kind of movie. Later, I saw a television version of “The Thing” when CBS showed Carpenter’s classic on Friday, April 3, 1987 and we can credit my father for exercising questionable parenting by letting me stay up to watch it with him. The Carpenter brand of horror – also seen in glimpses of “Halloween” – made an impression even if I’d not yet started to connect that the same person was involved with such differing genre staples. Carpenter always had a way of popping up when least expected. For instance, my parents took me along to see Carpenter’s work-for-hire 1992 “Memoirs of an Invisible Man” – I mean, how many people can claim to have seen that film, much less seen it theatrically? By this point though, I had begun to pay attention to credits in movies and I began to realize that Carpenter was a name that kept appearing in my orbit. Somehow the same guy had directed “Halloween” and “Escape from New York” and “Starman” and “Big Trouble in Little China.” Other than “Halloween” though, Carpenter’s films had largely been box office misfires or otherwise underperformed but they had had an odd staying power in popular culture. One of Carpenter’s signatures was his often-masterful use of full, rectangular wide screen film format. Thus, it was somewhat surprising that his films arguably found their fans in VHS and cable versions that hacked off nearly half of those well-composed images. The interesting ideas and craftsmanship in other areas of those films brought people to them just the same and I was one of those people, devouring Carpenter’s movies on VHS. When I bought a DVD player in the later 1990s, I started with two movies – “American Graffiti” and “The Thing.” Both had been released in wonderful ‘Collectors Editions’ by Universal Studios and, besides a feature-length behind-the-scenes documentary, “The Thing” on DVD had the added novelty of a commentary track that Carpenter had recorded with Kurt Russell. Carpenter was engaging on that audio track and I was delighted to learn that he had recorded commentaries for most of his other films. I listened to each of them as his films were released over the years, even having to track down a European copy of “Prince of Darkness” after U.S. distributors saw fit to exclude Carpenter’s commentary from the U.S. release. One thing that I learned from Carpenter was to look back at his idols, those being the great Western directors of the prior generation of filmmakers. Carpenter had an admiration for Howard Hawks and was enough of a historian that he contributed to a commentary for Sergio Leone’s “Once Upon a Time in the West.” If Carpenter was the rare director who tried to be a teacher, I was an eager student. Unfortunately, the 1990s were an odd time to be a budding John Carpenter fan. After “Big Trouble in Little China” failed at the box office, Carpenter returned to low-ish budgets with “Prince of Darkness” in 1987 and “They Live” in 1988 but neither film did well financially at the time. Fans might wonder why Carpenter took “Memoirs of an Invisible Man” as a job, replacing Ivan Reitman as its original director, but by 1992 he had not had a film released in several years. Of course, “Memoirs” was the rare film that he did not claim a possessive credit on but it did still contain some creative effects work and interesting homages to classic thrillers. The mid-1990s were a resurgence for Carpenter, with “In the Mouth of Madness,” “Village of the Damned,” and “Escape from L.A.” getting varying degrees of fan appreciation years later but none did well financially or critically at the time. From that decade, “In the Mouth of Madness” was perhaps the only debatable classic of that group. In the early days of online movie fandom, circa 1998, Carpenter’s “Vampires” was viewed as having the ingredients for a possible comeback. The results were mixed but the online fandom community of the time gave it some praise. I missed seeing that film in theatres but planned a party with friends to view the DVD of it… and promptly fell asleep somewhere during the middle of the film. Carpenter was slated to direct the “Halloween” semi-relaunch “H20” around the time that “Vampires” was headed toward release. He left that project after a public dispute with the film’s producer over the rather-impressive demand for a $10 million directing fee. Carpenter himself doesn’t spent much time talking about “Ghosts of Mars” from 2001 or 2010’s “The Ward” and neither do his fans. I saw “Ghost of Mars” theatrically with a justifiably-skeptical uncle in an empty theatre and immediately knew that Carpenter couldn’t keep going through the motions. If his remarks on the “Ghosts of Mars” commentary were any indication, he was more interested in smoking marijuana than in polishing the film. It was no surprise that Carpenter would follow up that misfire by cashing checks for remakes of his earlier films, such as “Assault on Precinct 13.” The shame here was that Carpenter was only in his 50s, an age in which he should have still been in his prime. “The Ward” might have held the potential for a comeback but one could only feel that Carpenter was creatively disinterested by this point and he really didn’t want to direct any longer. 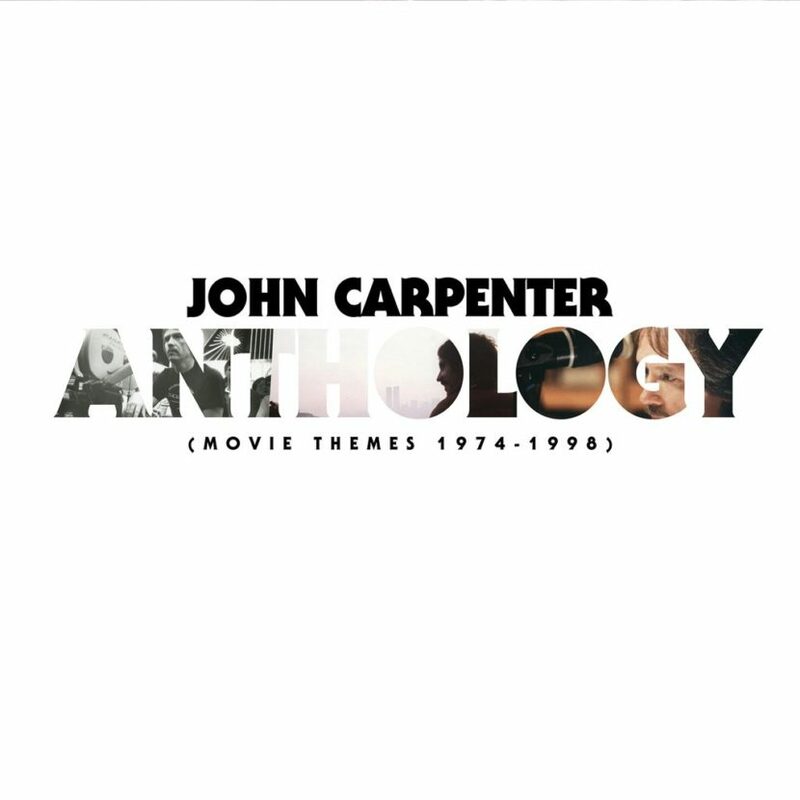 One of the things that always made Carpenter’s films so great was his direct involvement in scoring so many of his films’ soundtracks. Carpenter’s film titles had usually included his name in the possessive, his having come of age as a director during the 1970s auteur period in Hollywood with many of Carpenter’s contemporaries at USC’s film school also pushing for the European notion of the director as the film’s singular artist. Carpenter backed up that notion by wearing so many hats on his productions. Of course, Carpenter’s father had been a noted musician and music professor in Kentucky. Thus, it wasn’t as crazy as it might seem that Carpenter would also be a musician. I’d not gotten a chance to see Carpenter during his “Lost Themes” tour, as it never came to a location near me. 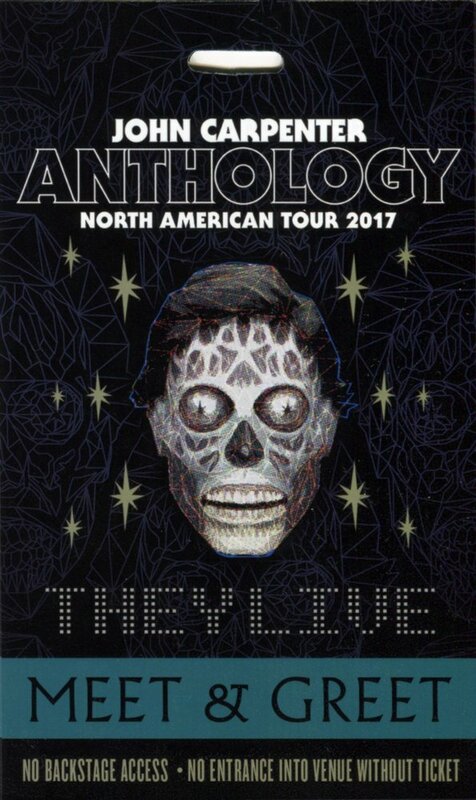 When the “Anthology” tour was announced with a stop in Minnesota, I made it a priority to attend. Reasoning that this would probably be the one chance in my life to be in the presence of the man who had become a legend in my mind, I made sure to jump at the chance to fork over a couple of hundred dollars for a ‘VIP’ pass to the show. I would have access to a ‘meet and greet’ with Carpenter and most fans probably bought that same package with the intent of getting memorabilia signed. My motive was primarily to shake his hand and hopefully not say something stupid to him. I would be remiss if I didn’t admit to having some buyers’ remorse though. In the weeks leading up to the concert, I experienced a mix of excitement but also had some apprehension. I had heard that a friend of a friend had recently worked with Carpenter on a film or television project that went nowhere. Secondhand word of Carpenter’s behavior during the collaboration had not been flattering. Yet, as I tried to reconcile that ‘insider’ information against reports of Carpenter giving great shows on the “Lost Themes” tour, I couldn’t help but wonder if it was music where Carpenter had truly found a way to again be creatively engaged. At least, that was my hope. Complicating matters, the venue for the Minnesota stop was not ideal – Myth was a somewhat notorious, greasy nightclub that managed to book national acts and could pull off a show but few people in the Twin Cities would talk it up as a favorite location. So, count me surprised that the staff was generally well-organized and the entire evening ran so well. The meet-and-greet was scheduled for 5:15pm and a line of around 60 people started to form on what was a chilly Tuesday evening. Figuring that I would eventually have my turn with the guest of honor, I ended up joining the line toward its rear. I was somewhat surprised to see to the local fan community come out with enthusiasm but perhaps had not given them enough credit. A couple of men ahead of me had flown down from southern Canada for the show, while a woman behind me had a “Halloween” statue that had been signed by all the actors who had ever portrayed Michael Myers. “Halloween” fans were the obvious majority but those like myself who favored other Carpenter films were represented too – such as the man in the ill-fitting Jack Burton tank top who did not seem nearly as bothered as most by the cold. Security involved a metal detector wand and a not-unaggressive pat-down. Once inside the club, we were issued ‘swag bags’ with our passes for the evening. 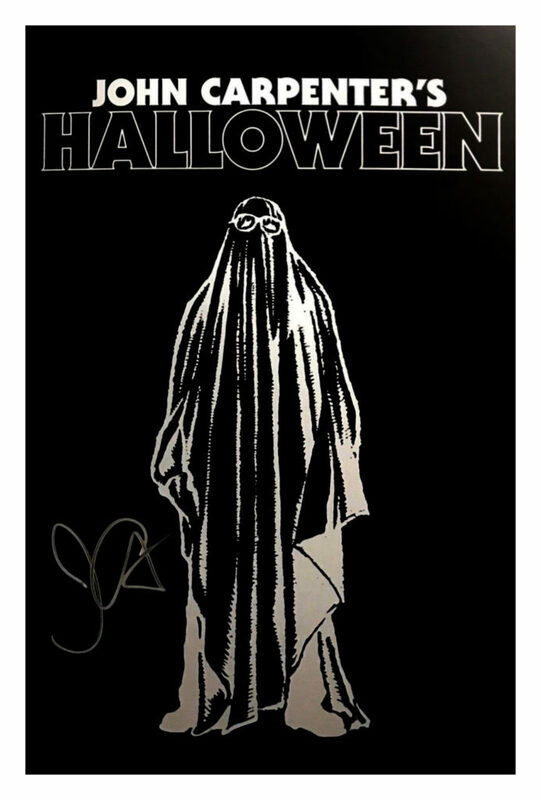 The canvas tour bags contained a signed “Halloween” mini-poster and a “The Thing” tour t-shirt. Nothing too exciting but not without value if folks had decided to try to sell the items to off-set the costs of the pass. Myth had a largish dance floor at its center and walking or loitering areas around its edges, with bars and a merchandise table set up to the rear and one side of the club. Crew were setting up the stage as the meet-and-greeters were put in a long line around the dance floor railing. Instructions were repeated a few times regarding the strict limit of only two items per person being allowed to be signed. I had seen photos of fans with Carpenter at prior stops on the tour and the meet-and-greet situation had initially looked as awkward as I had feared. The photos appeared far from ideal, with fans hunched over next to the man as he seemed to be striking a somber pose. Adjustments looked like they were made for the Minnesota stop though, with a chair placed next to where Carpenter was to be seated. That seemingly small touch would make a big difference. When Carpenter entered the area, he gave an energetic wave and the fans in line responded with a polite cheer. Anyone who has seen an autograph line at comic book or science fiction conventions knows that it is a mixed bag. The lines tend to move fast and, at worst, it can be a robotic exchange with the fan barely being acknowledged by the celebrity doing the signing. With most of the line of people ahead of me, I had plenty of time to watch from a distance as Carpenter greeted each guest. Few seemed to do much to interact with him or engage him and the line moved much faster than I had expected. As my turn grew closer, I noticed that many seemed too nervous to talk to Carpenter and their moment in the chair next to the man often lasted less than thirty seconds as a photo was first taken and then their two items were signed without conversation. A few seized the moment though and Carpenter engaged them, either in playful photos or exchanges. This seemed like a positive sign to me. Another positive sign was the fact that, as the line was coming toward its end and perhaps there was not as much of a sense of urgency. There was still an hour before doors to the venue would open and two or even three hours before the band would start their performance. The mood was relaxed. This was supposed to be fun and not just a stilted act to commerce. A table had been placed off to one side near where Carpenter was sitting and those in line were to leave bags or jackets on the table their turn approached. It was as if one was entering a sort of on-deck circle for their turn with Carpenter. From there, a ‘no-man’s land’ of sorts led over to Carpenter’s signing table. I would be lying if I did not admit that I suddenly felt a little bit nervous when the moment finally came for me to make that walk. Polite protocol was to be followed and, as the person ahead of me concluded their turn, Carpenter turned over toward me and it was ‘go’ time. I managed to avoid tripping while crossing the ‘no-man’s land’ and I settled into the chair next to Carpenter. My first impression was surprise at the fact that I was literally shoulder to shoulder with him. Any lingering nerves immediately passed though as he was welcoming, warmly engaging me as we initially followed the orchestrated routine of having a few photos snapped by the on-site photographer. With the photos out of the way, Carpenter moved toward the business of signing the two vinyl record covers that I had brought along. The first was a reissue of the soundtrack from “Escape from New York” and the other was an original record of Ennio Morricone’s soundtrack to “The Thing.” Carpenter regarded both items well, commenting that they were nice looking albums. I had had an odd passing thought in line that Carpenter might haphazardly sign his name across stark graphic design of the cover for “The Thing” but he was thoughtful in where he signed both items. In that case, putting his name down near Morricone, one of his idols who he had persuaded to score the film. As I had said though, I have never been a big ‘autographs guy’ and the signings were a nice bonus. If I was being selfishly honest though, I wanted a memory, some sort of brief connection, and not just scribbles on paper. First, I mentioned that I had attended USC and he seemed surprised by the reference, with Minnesota not exactly being a land plentiful with alums from that university. I confess that I then spoke with no shortage of hyperbole when I assured him that he was a ‘legend’ amongst students at the university. Again, he sounded surprised when he asked ‘Really?’ and I did nothing to back down from this claim, eventually an ‘Aw shucks’ vibe from him coming through in the moment. One might assume that Carpenter was being modest but he had a quote widely-distributed in a 1999 issue of Film Comment magazine that “In France, I’m an auteur; in Germany, a filmmaker; in Britain; a genre film director; and, in the USA, a bum.” Was it possible that he still viewed his legacy with a certain insecurity or dismissal? The answer wasn’t clear. Regardless, his interest had seemed piqued and he asked me how I had ended up out in L.A. While preparing for the evening, I had reflected on exactly why Carpenter had made an impression on me. Why was meeting him, even if it was in this brief, staged situation, important to me? I related the answer that had come to me by describing that my road to USC had started as a budding film fan in rural southern Minnesota and that his commentary tracks had been instrumental in giving me an early education on how films were made. His references to his influences on those tracks had also opened my desire to get familiar with legendary directors who had come before him. Carpenter seemed genuinely touched by his impact and was appreciative of the remarks. As I said, there was a teacher side evident in him and it was clearly satisfying that at least a few fans, including me, had connected with his efforts in that regard. So, those were the two general topics that we discussed in my brief time in ‘the chair.’ As I said, the mood had grown leisurely but there were still a few people in line behind me and I did not want to overstay my welcome. As I gathered up my signed items to depart, Carpenter took the initiative to offer his hand to shake – I’d nearly forgotten that that act had been my initial goal – and I wished him good luck on the concert that evening. And, yes, by the way, there was still a concert to attend. After grabbing dinner nearby Myth, I re-entered the club early since those of us with the meet-and-greet badges were allowed back inside before the general ticket buyers. Most attendees were going to have to stand for the duration of the show but Myth staff had put out a few rows of seats near the stage and I snagged a seat in the front row, finding myself at a downward angle from where Carpenter’s keyboard had been set up in the middle of the stage. I knew that the show would be short, given reports from past tour stops of the entire performance lasting barely more than an hour. That was fine by me as I was there for quality, not quantity. The early entry folks were all seated by 7:00pm and we waited until after 8:00pm before the evening’s main event began to unfold. A local electronic music artist had been listed as the opening act but when he began playing around 8:10pm, it barely registered to me or most of the crowd. Frankly, I didn’t realize that he was even playing at first, as he was situated in a truly odd spot to the far side of the stage. From what I had gathered, Carpenter and his band were waiting outside in the club parking lot aboard the privacy of a coach bus and this opening act must have not been allowed to interfere with Carpenter’s band setup on the stage. There were a couple of characteristics about the show that made it truly memorable. First, there was the general notion that attendees had the auteur of so many genre classics from the 1970s through 1990s standing on stage, music that he had composed playing to those films while some of the most memorable moments from those films were played on screens behind him. Carpenter would later refer to his son Cody as being the ‘lead synthesizer’ in the group and that role made sense. Again, the band members were doing much of the playing and Carpenter’s musical contributions at his keyboard were hard for me to see but, at the very least, he seemed to be adding punch at times. The second item to note was that punch. There was some very aggressive bass rocking through the venue. The general sound was surprisingly not uncomfortably loud but the bass was such that it literally shook my chair for the entirety of the performance. The closest comparison that came to mind was a movie theatre that had been outfitted with seats that rumbled or shook during action scenes in a film. This might sound annoying but it ended up being a great part of the experience, with Carpenter’s keyboard contributions often literally taking his audience for a ride. The audience ended up nicely filling in the club with a few hundred-people bringing more energy than I would have expected. There were many cheers of “John F***ing Carpenter” or variations on that phrase from those behind me throughout the night. 1) The concert opened with the theme from “Escape from New York” and its opening notes provided a perfect series of bass waves to ride. 2) The catchy theme to “Assault on Precinct 13” was next and it was a great compliment to the opening song. …and he pointed those fingers right at me! In fact, it took me a moment to register what was happening, as Carpenter then did a whole sustained eye contact bit. The entire scene only lasted a few seconds but a voice in my head could scarcely believe that it was happening. The 1990s me, watching “Village of the Damned” on VHS one summer night, basically died and went to geek heaven in that moment. 4) My transcendent moment of the night over, the next song switched to the theme from “The Fog.” This theme always reminded me a little bit of the “Halloween” theme but its stands on its own as memorable. Cody Carpenter’s mother – and John’s ex-wife – Adrienne Barbeau was the film’s star, so there were some deep family ties behind that music. 5) The set list then stepped away from the movie themes for the first time to hit a couple of songs from the “Lost Themes” albums, starting with “Vortex.” Carpenter introduced that song as being from the ‘movie in your mind’ and “Vortex” was a favorite from those albums, as it hinted at some of Carpenter’s early-1980s themes like “Escape from New York.” At least one other “Lost Theme” seemed to have been played but I was not familiar enough with the albums to be able to name it. 6) The image of “Rowdy” Roddy Piper got a howl of approval from the crowd during the theme for “They Live.” The entire number gave way to a love-fest for this film that has only risen in cult status over time. Carpenter had introduced the song by picking up a pair of shades that were like the ones worn by Piper in the film and Piper’s co-star, Keith David, received a nice reaction from the crowd when he appeared on screen. 7) Carpenter did not write the theme to “Starman” but he seemed proud to introduce the work as being from the ‘late, great Jack Nitzsche.’ Nitzsche had an interesting career, bouncing around between rock and film work in the 1960s and 1970s, into the 1980s. I could see many criticize the music for coming across as too ‘over the top’ and it was undeniably a big wall of emotional sound. Given the cynicism of so much of Carpenter’s work though, it was wonderful to have this unexpected shout to love. Carpenter referred to the film as his only ‘love film’ and it was another example of his dabbling in different genres. 8) Ennio Morricone’s work on “The Thing” provided a very Carpenter-like main theme and its performance was perhaps the only misfire of the night. The song’s distinctive ‘heartbeat,’ a stark and pulsing beat, ended up getting drown out by the band’s accompaniment. This was not the case with its performance on the “Anthology” album and I could only conclude that there had been a mistake of some sort with the live show’s mixing. The clips on display served as a reminder of the notable amount of gore-filled practical effects in that film. 9) Another selection from “Lost Themes” was them performed, with “Distant Dreams” having been the first single off the “Lost Themes II” album. That song was not quite as memorable as “Vortex” from the first “Lost Themes” album but it was an enjoyable song just the same. 10) “Have you paid your dues?” was the quote that Carpenter used to open the next song, referring to it as having been said by ‘one of my best friends.’ Of course, this was a reference to Kurt Russell’s line in “Big Trouble in Little China.” The performance that followed did not include any of the lyrics from the vocal version of that film’s main theme but it played smooth instrumentally and got just the sort of solid reaction that one might have expected. 11) With many of the fans in attendance appearing to be big fans of “Halloween,” it was of little surprise how enthusiastically they greeted that film’s iconic theme song. 12) The theme to “In the Mouth of Madness” was hinted as being the finale for the night. Carpenter had said in interviews that the opening of this song was ‘inspired’ by Metallica’s “Enter Sandman” and it was easy to hear that influence. That song had been a temporary track during test screenings of the film and it got the kind of energetic reaction that Carpenter wanted. Carpenter’s homage played well with the crowd. When “In the Mouth of Madness” was finished, the band members then exited the stage and the crowd worked up a cheer to try to entice them back. Of course, we all knew that there would be an encore. 13) “Body Bags” was another 1990s-era film from Carpenter, a reworking of three episodes of a “Tales from the Crypt”-like anthology series that Showtime canceled soon after it began development. The music work for those segments were not iconic but it was not un-entertaining. 14) “Vampires” steered closer to a true western than most of Carpenter’s other films and the twangy sounds in the soundtrack reflected that mood. There was a loud shout out by one fan for James Woods, who had starred in the film. 15) “Prince of Darkness” was cradled right between “Big Trouble in Little China” and “They Live” in Carpenter’s filmography but it is often overlooked. Its main theme had an uncomfortable, choral sound to it that touched on the darker religious tie-ins to the story. 16) Carpenter’s closing remark was to “Be careful to drive carefully tonight because Christine is out there!” Not surprisingly, the show closed with the theme to “Christine,” the same driving rock song that closed the “Anthology album.” I was not as familiar with this theme as others but it was easy to see how it had become a fan favorite over the years. As the band took a bow at the front of the stage, someone from behind me screamed out “Long live John Carpenter!” Long live, indeed. In summary, my experience at this concert undeniably benefited from a few things. I had not been strategic about it but my having waited to get in line near the end for the meet-and-greet meant that the situation was much less rushed as the line had mostly completed before my turn arrived. One could argue that in some circumstances the celebrity in question could be running behind and being at the end would be a disadvantage but there was plenty of time before the venue was scheduled to open. Being toward the end paid off in getting to have what I felt ended up being a truly memorable interaction with Carpenter that exceeded my expectations. As for the concert itself, getting in early led to claiming an amazing seat position during the show – it was literally like Carpenter and his band were jamming in my house. There they were, with a giant subwoofer that they brought along to shake the place while showing greatest hits clips from films spanning 25 years. Even if I had only obtained a general admission ticket and was standing further away from the stage, it would have been a great show. It was simply wonderful to see Carpenter, in the twilight of his creative output, truly seeming to enjoy the fan adulation as he danced to the highlights of his career. It would be hard to name another filmmaker from any era who could be in such a situation, with both their musical and cinematic greatness converging.